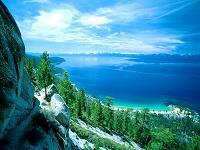 Sand Harbor State Park on Lake Tahoe is an exceptional Nevada State Park. Sand Harbor is located three miles south of Incline Village on Hwy 28 on the east side of Lake Tahoe on the Nevada side. 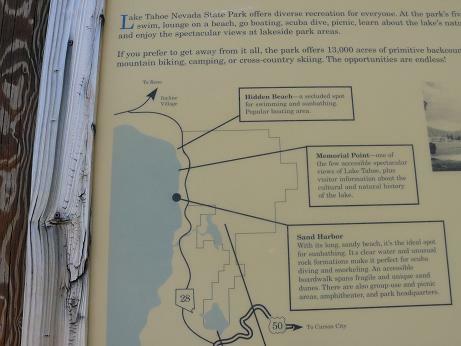 This is a picture of a posted sign that shows the amenities at Sand Harbor. A walk around the Boardwalk Trail is a MUST DO!! Be sure to bring your camera, the views are incredible!! 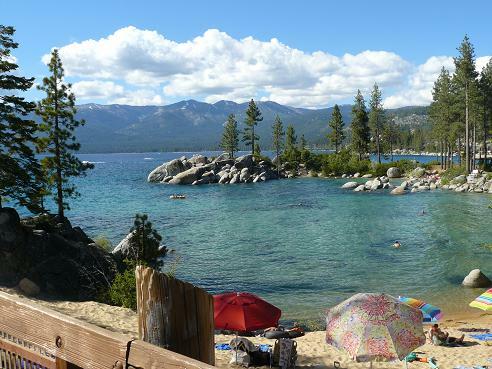 The Sand Harbor beach area is one of the most popular Lake Tahoe Beaches with a long sandy beach, and rocky coves and amazing views! There are 55 acres of long sandy beaches, rocky coves, shady forested areas and panoramic lake views within the Sand Harbor State Park area. The water is crystal clear and allows for great swimming, scuba diving, and snorkeling. Lifeguards are on duty from Memorial Day through Labor Day. 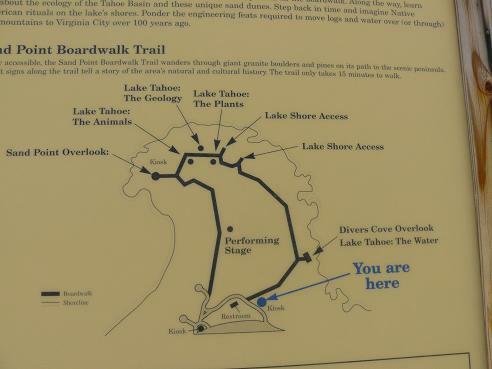 Sand Harbor has the Sand Point Boardwalk Nature Trail (shown above) that is a short, 1/3 mile boardwalk trail that is a handicap accessible trail that can be walked in about 15 minutes. There are educational interpretive signs along the way and numerous places and benches to stop and enjoy the awesome views along the way. The numerous rocks in the area, especially in the Divers Cove area, make Sand Harbor a photographer's dream!! The rocks in the area provide great photo opportunities of the Lake. 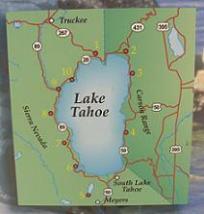 Sand Harbor has a boat launch area that has a separate entrance just North of the main entrance. 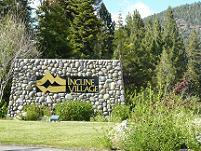 (closest to Incline Village) See below in the Hours & Operating Schedule section for the details on the restricted hours for 2014. Divers Cove at Sand Harbor is a popular place for swimming, scuba diving, and snorkeling, and the views are pretty fabulous too! There is also a Group Area/Ramada group-use area set on a pine-dotted, rocky point that accommodates groups of up to 100 people. Reservations must be made in person or by phone: 775-831-0494. In addition to many different picnic areas and group picnic areas with tables and barbeques, Sand Harbor is home to the Char Pit Restaurant where food and drinks can be purchased. They have a great outside seating area as well as indoor seating. Other amenities include: Restrooms, Visitor Center and Park Store, Parking and boat rentals (Kayak, Sea Doo, and Stand Up Paddleboards (SUP), Wakeboards, and Hobie Mirage Pedal/Paddle Kayaks from Sand Harbor Rentals. 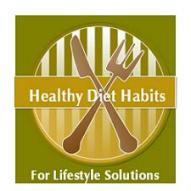 They also offer Guided Tours and Lessons. 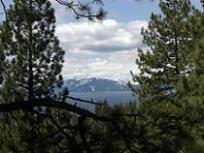 There is also a short half mile trail from Sand Harbor up north to Memorial Point that provides access to many secluded Lake Tahoe beach and rock areas. A $2.00 discount is available for Nevada Residents, and season passes can be purchased. For all the fees for the Nevada State Parks: Nevada State Park Fee Schedule 2014 (revised January 15, 2014). 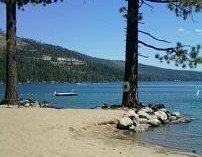 "BOAT RAMP CLOSURE - Beginning Monday, May 19, 2014, the Sand Harbor boat ramp will be closed every Monday and Tuesday until further notice due to reduced seal inspector staff, and low lake levels. 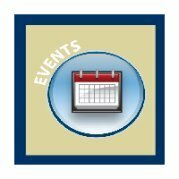 It will be open on Monday, May 26, 2014 for the Memorial holiday weekend, and then closed on Tuesday and Wednesday, May 27-28, 2014. 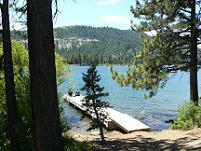 Complete boat ramp closure is expected by July 1, 2014. 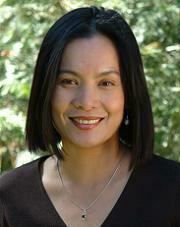 Thank you for your patience." Sand Harbor Main Beach Hours: May 1 - Memorial Day, 8am - 7pm, day after Memorial Day - Labor Day, 8am - 9pm, day after Labor Day - September 30, 8am - 7pm, October 1 through April 30, 8am - 5pm. For additional information, check out the State of Nevada - Division of State Parks Website area for Sand Harbor. The Photo's above, will randomly change with all of the Sand Harbor photo's that I have uploaded in the Truckee Travel Guide's Flickr photo's "Sand Harbor State Park Photoset". To view all the photo's, just click above on the "Sand Harbor...." blue link to view the entire set of photo's, or just click on your browser "refresh" button. 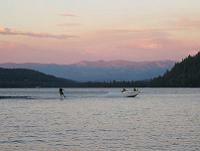 I promise to use it only to send you I Love Truckee. Fantastic Views of Sand Harbor from the Flume Trail! !